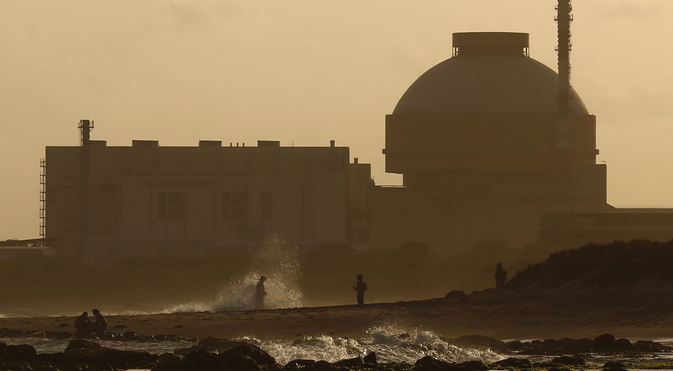 The first unit of the Kudankulam NPP is currently the most powerful nuclear reactor in India. It was transferred to India for warranty-period operation at the end of 2014. Warranty operations of the first unit of the Indian Kudankulam Nuclear Power Plant, built with Russian assistance, will last until the end of 2015, after which the unit will be permanently transferred to the Indian side, according to Atomstroyexport (ASE) CJSC, responsible for the construction of nuclear power plants outside of Russia and a subsidiary of the state corporation Rosatom. The warranty operations of the unit started at the end of 2014. “Together with our Indian partners, we have travelled a long and fruitful path of co-operation before we launched the first unit of the Kudankulam NPP. The warranty operations demonstrates, first of all, the successful completion of all the necessary work and testing of the block, and secondly, the full confidence that our Indian partners have in Russian nuclear technology. This station has already supplied billions of kilowatt-hours of electricity to the electric grid of India, and its future contribution to a stable, reliable power supply for the country cannot be overestimated,” said Valery Limarenko, president of the Russian combined company NIAEP OJSC-ASE CJSC, whose words were quoted in the announcement. “Our company has built and handed over to warranty operations the safest nuclear power plant unit in the world today. The Kudankulam NPP project includes the implementation of a harmonious blend of traditional and newly designed active and passive safety systems. In this NPP we have implemented a number of systems that meet the post-Fukushima requirements of IAEA,” said Andrey Lebedev, vice-president of the combined company. “It is remarkable that this transition to warranty operations and has allowed our Indian colleagues put the unit into immediate commercial use. I feel confident that in the future, this nuclear power plant will become a reliable source of stable electricity supply to consumers in the country,” he added. The first unit of the Kudankulam NPP is currently the most powerful nuclear reactor in India. The customer and the operator of this station is the company NPCIL Ltd. The construction of the first and second blocks of the NPP, using VVER-1000 reactors, with electricity generating capacity of 1,000 MW each, is being carried out from the Russian side by the combined company NIAEP OJSC-ASE CJSC, and from the Indian side – NPCIL Ltd. The basis for the construction of the Kudankulam NPP is the NPP-92 Project, which fully meets the requirements of modern regulatory and technical documentation of the Russian Federation, IAEA, and has been certified for compliance with European Utility Requirements (EUR).